Embattled city lord mayor Elias Lukwago still has a chance to appeal against the councilors’ decision to have him impeached. This is according to the NRM caucus spokesperson also northern Uganda youth Member of Parliament Evelyn Anite. Anite has defended the councilors’ decision to vote Lukwago out of office saying they were only implementing recommendations of the tribunal. 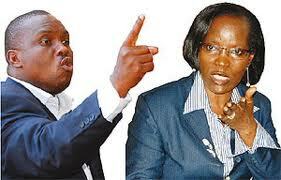 Lukwago was impeached this morning after a motion was seconded by 29 out the 34 councilors. The meeting was presided over by Kampala minister Frank Tumwebaze and Executive director Jennifer Musisi. Lukwago is still at Mukwaya general clinic where he was admitted on Friday with Hypertension. Speaking from his hospital bed, Lukwago says there has been some improvement after he received treatment. However when asked about his impeachment he referred the matter to his lawyers saying that what is important now is to get back on his feet. In a related development, the police have threatened to arrest any politician found trespassing in Kiseka market area. This follows the running battles between the police and the traders who have been demonstrating in protest of the impeachment of the Lord Mayor Erias Lukwago. According to the operations commander Kampala North, Sam Omala, some politicians are trying to manipulate the traders into taking part in unlawful activities. He says the police will maintain presence at the market until the situation normalizes.